The Benjamin Franklin Effect has recently been proposed as a cognitive bias psychological phenomenon. There is a tendency to continue doing something once we’ve started doing it. This applies to both positive or negative actions. If we do a favor for someone, we are more likely to do another favor for that same person in this case, than to do a favor for them if we hadn’t done them a favor already, or if we had instead first received a favor from them. It’s a sort of reverse likability psychological effect. Instead of you doing someone a favor and them liking you, you ask them for a favor, and they like you for it. It implies a likability on your part for even asking them. We justify continuing to do favors by internalizing the reasoning is based upon us liking them. We can also use the same mechanism for justification to not do favors and also to justify doing a wrong to someone instead. Learning to hate someone that we did a wrong to, possibly by dehumanizing them, allows us to justify what we did. An example is of soldiers who kill or murder others and come to hate the enemy through psychological gymnastics that helps them to decrease the dissonance, discomfort, anxiety, insecurity, contradiction and conflict of taking another’s life. Generational animosity or hatred towards other groups can also make more sense through this Ben Franklin effect. There are vendettas that take place between families are clans and even between various cultures. 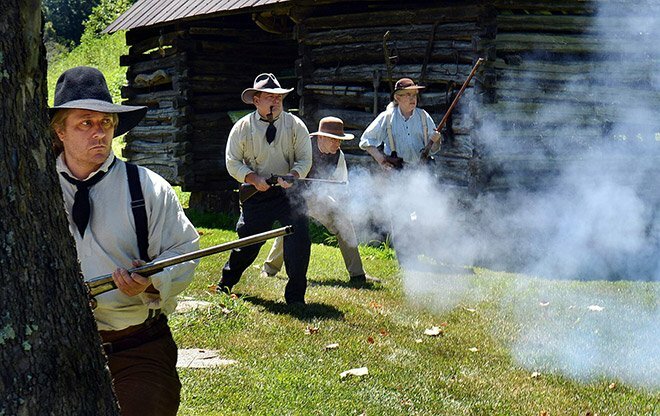 One example from the United States is the generational feud between the Hatfield and McCoy’s. In either positive or negative cases of the Ben Franklin effect, we are engaging in a process of identification or de-identification with our sense of self, self-view or self-image. In the positive sense, when someone asks us to do a favor for them, we identify with them through likability of them appearing to like us enough to ask us a favor, which engenders a reciprocal likability in ourselves. Liking someone applies in the valuation or salient sense, but also in the likeness, similarity, same kind, etc. So we identify on that basis of them as ourselves to some degree through the kin-kind-like-similarity as part of the reverse likability. In the negative sense, we may de-identify with another to justify doing something wrong to them. To find ways to not like them and excuse what we did, we make them less like us, less identified with our sense of self, and we dislike them as a result. The origin of it all comes from Benjamin Franklin of course. sourceResearch by Jecker and Landy (1969) involved asking some students to participate in a competition to win money. Once completed, the winners were divided into three groups. The first group was asked by the researcher to return the money so he could use it because it was previously using his own funds to pay for the winners and has come up short. A second group was asked by the secretary, not the researcher themselves, to return the money to the researcher because department funds are low, not because the research have funded it himself. The third group was not approached to return any money. Afterwards, the groups were all asked how much they like the researcher. The first group like in most, the second least, with even the third group favoring him more than the second group. These findings indicate that requests or favors from an intermediary decreases someone’s likeness and willingness to help someone because they aren’t asking themselves personally, since a direct request does increase likability. Another test had a “teacher” use positive and negative reinforcement on someone doing a task who was also in on the experiment, while subjects watched the interaction. They were praised for success in one test, and insulted for failure in another. The subjects of the experiment were asked to judge the attractiveness or likability of those who receive positive or negative comments. The reinforcement of someone else’s attitude affected the subjects who were asked to judge those people, and biased them towards whatever attitude the teacher displayed towards the task taker. 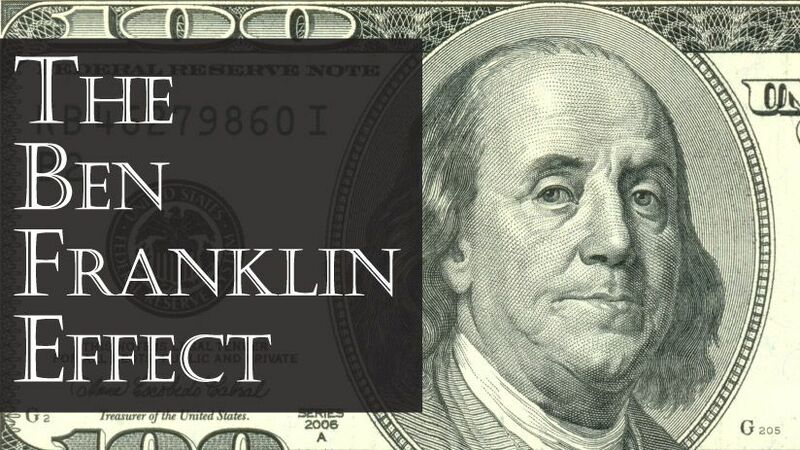 The Ben Franklin effect can also be used as a technique to rapidly build rapport in sales relationships, like gaining a desired client. Instead of offering to help the client, ask the client for assistance. Ask them for their insight and to share what product benefits their most attracted to, where they think the market is headed for this business, or what products they might be interested in several years from now.